BCS #195 is out today, another special double-issue for BCS Science-Fantasy Month 3! Aliette de Bodard (“The Moon Over Red Trees” in BCS #157 and podcast BCS 136, “Memories in Bronze, Feathers, and Blood” in BCS #45 and podcast BCS 041, and “The Breath of War,” a finalist for the Nebula Award, in BCS #142 – Science-Fantasy Month 2 and podcast BCS 121) returns to BCS with “A Salvaging of Ghosts,” a haunting story of deep spaces and family. Sarah Pinsker offers “The Mountains His Crown,” a tale of farmers subsisting against imperialist whim, and Jason Sanford in “Blood Grains Speak Through Memories” posits a world where caretakers have become linked to the environment. “The Mountains His Crown” releases on the website next Thursday, in text and as a bonus podcast episode BCS 171 guest-narrated by Folly Blaine. The full issue is available now on ebook at Kindle and Weightless Books. The first BCS Audio Fiction Podcast episode with BCS #195 is BCS 170: A Salvaging of Ghosts, the Aliette de Bodard story of deep spaces and family. It’s guest-narrated by Tina Connolly, BCS author and narrator of past podcast episodes including BCS 156: Seasons Set in Skin by Caroline M. Yoachim, BCS 150: The Punctuality Machine, Or, A Steampunk Libretto by Bill Powell, and BCS 121: The Breath of War by Aliette de Bodard, from BCS Science-Fantasy Month 2. 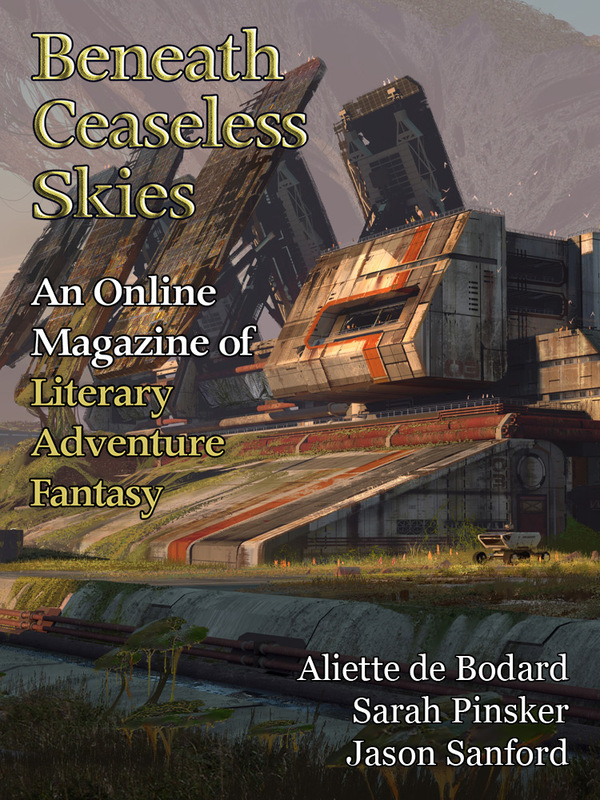 Also releasing next Thursday is a new episode of the BCS Audio Vault podcast: Aliette de Bodard introducing that podcast of her story “The Breath of War” from BCS Science-Fantasy Month 2, which was a finalist for the Nebula Award last year. All behind another view of our special science-fantasy cover art, “Research Lab” by Sung Choi. BCS Science-Fantasy Month 3 will continue next week, with the website release of the bonus story, bonus podcast, and BCS Audio Vault podcast! Epub? Are you switching to only using the two stores for distribution now? The free ebooks will be released next week after the bonus story goes live here on the site. Ebook subscriptions and sales are a big part of our revenue, so we give those readers all the stories a week early, before the website.